Congrats to Vic! Please contact me to claim your prize! I am hosting a small giveaway this week. OASAP sent over this vintage pin buckle cross-body bag a few weeks ago. 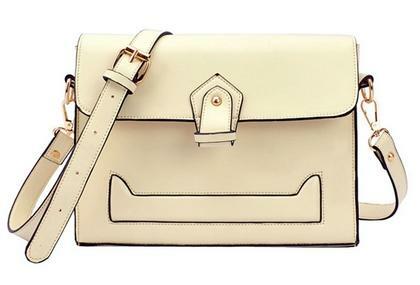 Since I already have a similar cross-body bag, I am giving away this bag (in cream) to one lucky winner of Sydney's Fashion Diary. Giveaway is open to US readers only. To enter, simply leave me a comment and let me know you'd like to enter. That's it! There is no need to do anything else. Although, I would appreciate if you could follow me on either Google Friend Connect or Bloglovin. I'll pick a random comment next Sunday (08.26). Be sure to check back to see if you're the lucky winner! That's a gorgeous bag. I would like to enter to win! Wonderful bag! I would like to enter to win it. Thanks for the giveaway! Cute bag. I would love to enter this giveaway. Thanks! I have been eyeing a crossbody bag like that! I would like to enter! Thank you! So cute and versatile! I'd like to enter! Cute bag! I would like to enter. :) Following you on GFC already. Would love it if you can follow back too? I would love to enter! The bag is gorgeous! Hi, I'd love to enter the contest! I would like to enter Sydney and i am your follower. Thanks! Please enter me! This is so cute. i'd like to enter. love the bag (and your blog)! I've been looking for a cross body bag. I'll love to enter. Oh my goodness. I want it so much. But I live in Canada! Good luck to everyone! Super cute bag! I'd love to enter! Love the bag! Would like to enter. I would love to enter! Thank you miss sydney! omg i love this bag! i been looking for a crossbody. please enter me!!! Love the purse and would love to own it even more! Enter me in! I already follow you on GFC and Bloglovin! I would LOVE this bag - it's beautiful (and my birthday is on Friday so what a great surprise that would be to win!). Thanks for the opportunity!!! What a beautiful cross body purse. Please enter me. Thank you Sydney. lovely bag and awesome giveaway! Love the bag - I'd love to enter! ooh! another perfect bag for school and clinic. i would love to enter. thanks sydney! Such a cute bag. Please enter me and thanks so much for the giveaway! Fabulous bag. I would love to enter. Many thanks. cute cross body bag ! would love to enter ! Hi Sidney, I would like to enter! I follow you on Google Friend Connect and Bloglovin! Adore the bag. I would like to enter. Love the bag! I'd love to enter to win this giveaway! Gorgeous bag! I follow you through google reader, does that count for extra credit warm fuzzies? Too cute! I'd love a chance to win this bag. Hi Sydney, I would like to enter. Thank you! I would like to enter! Hopefully I win! I would love to win it! thanks for hosting. Super chic bag. Appropriate for fall/spring. Would like to enter. Cute bag! Would love to enter please! Lovely bag. Would like to enter. Hi Sydney! Not sure if I've ever commented. I sure enjoy your blog! Thank you for the giveaway! I have been a reader of your blog through Google reader for over a year, I love your blog! Is your bag the orange or same white version as the one you're giving away? Oh, and count me in the giveaway! Thanks! I would like to enter please. Thanks! I'd love to enter this giveaway! Thank you! Love this bag, I would like to enter! Thank you for doing this giveaway! I would like to enter :) I also follow you on BlogLovin. HI Sydney, I'd like to enter this giveaway . Thank you! I'd like to enter :) Thank you! Thanks for doing this giveaway! i'd like to enter. So cute! I would like to enter! Really cute bag, I'd like to enter! Cute bag! I'd like to enter! That's a very nie bag that can go with so many different outfits! I would like to enter :) I follow through Google Reader. Thanks! Very cute. Thx for the giveaway! I'd like to enter. Thanks, Sydney! I would like to enter this giveaway. Thanks!! The bag is gorgeous! Thanks for doing this giveaway. The bag is beautiful and I would love a chance to win it. Hi Sydney! I'd like to enter please. i've been looking for a neutral colored bag for a while and this would be perfect. Enter me too please! Thanks for hosting Sydney! Please enter me! Following you both on GFC and Bloglovin'! LOVE the bag. Thanks for hosting the giveaway! Cute bag! Please sign me up. Thanks. Covet! Absolutely adorable bag, and I'd love it. Super cute bag. Please enter me. I follow you on bloglin'. What a great bag! Thank you Sydney! Great giveaway! Would love a shot at winning! It's beautiful! I'd love an entry please. Cute bag! Please enter me! I could use a cute, non-diaper bag... pretty please consider me. Thanks for the giveaway, I would like to enter! I would like to enter! also, I follow you on google reader. I would love to enter your giveaway, thank you! What a perfect bag, esp. for mommys since it is hands free. The color is beautiful too. Wish me luck! And thanks for the giveaway! I would love to enter your giveaway. Your blog is wonderful! Love your prego outfits! We gave birth to our baby girl in April. Wish you would have been pregnant the same time as me as I was desperate to find cute outfits during that time! Will refer to your blog archives the next time im pregnant :). Hope you pick me for the giveaway!! Love your blog. I am a 36 week pregnant fellow petite. The bag is very nice and would love to enter to your giveaway. What a cute bag! Thank you for the chance to win. Ah! Such a cute bag. I would love to enter! I would like to enter! Your blog is a great read! Enjoy your pregnancy! My husband and I are planning to have baby number 2, too! I would love to enter the giveaway. Thanks for thinking about your readers! I'd like to enter! Thanks, Sydney! Love the bag! Please enter me! Pretty purse! Please enter me:) Take care of u & d baby! cute bag~~ I would like to enter. thanks! I'd love to win if you haven't already picked yet! Ps...I have a US address. Thank you so much! I would love to enter for this amazing bag.